Quince (Cydonia oblonga) is a unique fruit that is closely related to pears and apples. It is the only member of its genus. Quince is native to the Eurasian region which includes countries such as Armenia, Turkey, Uzbekistan, Hungary, and Macedonia. It is quite common in the Eurasian region that researchers believe that when “apples” were referenced in this region’s ancient history, it was most likely quince that was being spoken about. 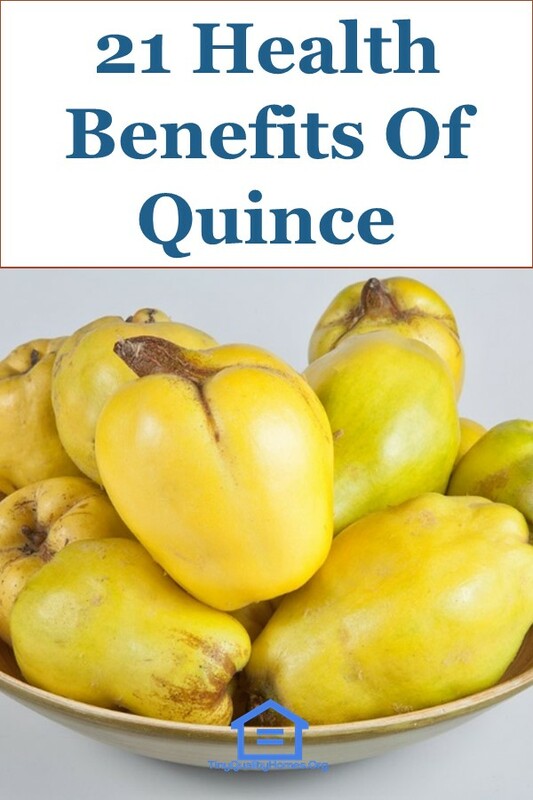 The health benefits of quince include its ability to; aid in digestion, reduce cholesterol, prevent cancer, relieve gastrointestinal disorders, stabilize blood pressure, improve skin health, and relieve inflammations. Quince isn’t just there to be eaten raw, it actually brings about some beneficial remedies when heated. If you boil or grill a quince you can expect a more settled stomach once you’ve consumed it. The reason for this is that quince is a natural diuretic. The digestive system as we all have experienced at some point in our lives can be quite unpredictable, but if you do struggle with an uneasy stomach regularly, then do yourself a favor and keep some quince jam in the kitchen cupboard. Quince is also effective for nausea and vomiting during pregnancy. Do you struggle with high blood pressure? Sure, there is medication for that, but wouldn’t you rather try the natural route, if there was one? If yes, then get to the local grocer and stock up on quince! Thanks to the potassium levels in the fruit, your blood pressure can be regulated to meet the optimal levels that your body needs in order to stay healthy. Potassium is a powerful mineral that can actually aid your cardiovascular system in such a way that it reduces the chances of heart attacks. Since this wonderful fruit is rich in antioxidants, it’s a brilliant inhibitor for ailments and diseases, one of those being cancer. Cancer is could be caused by exposure to harmful free radicals, so when one includes a fruit like quince into their diet, tannin is introduced into the body which essentially decreases the likelihood of getting cancer. Quince has a marvelous calming effect on the mind and body. It’s not to say that if you’re running around frantic and take a bite of quince, that you would be overwhelmed with a sense of relaxation. But by simply incorporating this fruit into your diet, slowly but surely you would start to feel a calmer sense of wellbeing when it comes to how you deal with the daily stresses in life. Quince is rich in fiber which helps facilitate digestion. Furthermore, dietary fiber can also help relieve gastrointestinal disorders such as diverticulitis and inflammatory bowel disease (IBD). Additionally, the epicatechin and catechin in the fiber are likely to bind with carcinogenic toxins in the colon and aid in their expunge from the colon. The vitamin and antioxidant content of this fruit are quite high. It’s no wonder those who choose to consume this fruit tend to have healthier skin than normal. Worried about wrinkles? Quince helps prevent them! As a result of the antioxidants in quince, one’s cholesterol (LDL) can be drastically reduced. Quince is yet another natural remedy to serve as an adjuvant therapy to traditional medication that doctors tend to prescribe. As a result of quince consumption, fat oxidation is minimized and therefore the fat content that surrounds your organs and veins would be far lower. As we’ve mentioned, quince contains numerous nutritional minerals and vitamins. Zinc and iron are just two that go a long way to increase red blood cell count. What does this mean for your body exactly? Two ailments quince could serve as remedy for are anemia and iron deficiency, leaving you feeling super fresh each and every day! Quince contains flavonoid which directly fights harmful free radicals that expose the eyes to retina damage. Do you avoid driving at night because the night blindness is getting bad? Start eating this fruit and watch how this condition starts to gradually lessen. Just by adding quince into your diet, you are improving your diet dramatically due to the long list of nutritional value you gain. Quince is also low in calories and could serve as a calorie-deficit diet for those wanting to lose weight. If you are looking for a way to reduce those random cravings in sugar levels as well as your high sugar levels, eat quince! Its fiber would lower your blood sugar levels significantly. For diabetics, it’s advisable to include quince in your diet as it helps relieve some symptoms of diabetes. Research on model rats has shown that quince has hypolipidemic, hepatoprotective and renoprotective effects on these rats. Our immune systems need Vitamin C to fight bad bacteria we end up having in our bodies for different reasons. Quince is rich in vitamin C and also helps reduce inflammation especially when consumed raw or juiced! Sometimes we’re born with it and sometimes they develop, but we all hate them! Allergies can be a source of pain and discomfort. This fruit has proven to be able to manage our allergic reactions, such as atopic dermatitis-like skin, quite well. Where possible, adding quince, in the form of a gel, to the skin would relieve symptoms of skin reactions. Having liver trouble? Regular quince intake can actually be beneficial in reducing the inflammation of the liver. With improved blood circulation due to the minerals in quince, oxygen travels through the body better, ultimately leading to stimulated hair follicles and better hair growth. This healthy fruit has potent antiviral qualities. If flu season is around the corner, quince would help reduce your susceptibility to flu triggers. You could start noticing a change in how often you are a victim of the odd cold and flu. It’s not just the fruit that can aid your health, in this case, the seeds of quince could actually inhibit your sore throat. The oil found in the seeds soothes this nasty pain. Phenolics found in Chinese quince can relieve gastric ulcers. The juice of quince is equally beneficial for this ailment. Peptic ulcers are also soothed in the gastrointestinal tract when consuming quince juice! Quince is a natural anti-inflammatory and, therefore, is capable of reducing chest inflammation which causes your chest to tighten. To make quince more potent for this purpose, you could mix it with lemon. Our stomach is extremely sensitive when it comes to certain things we put in our bodies. If you struggle with colitis or have minor intestinal issues, by adding quince to your diet, you will start to experience relief from these conditions. Pregnant? Quince is an effective remedy for morning sickness. Even if you have constipation or on the flipside, diarrhea, quince syrup would help relieve their symptoms. In fact, numerous gut-related issues could be relieved if you introduce quince into your diet. If you’re unfortunate enough to ever contract tuberculosis, consuming quince will aid in the relieving symptoms of this disease. Quince juice consumption can also help relieve symptoms of respiratory inflammation, hepatic insufficiency as well as dysentery.